Vision Mini - Designed to work smart! The Vision MINI smart camera is designed specifically for reliable vision performance in embedded identification and inspection applications. As the world’s smallest fully integrated vision system, the Vision MINI’s ultra-compact size and wide angle optics provide the best performance available for machine vision tasks at close range.With the Vision MINI, OEM design engineers can quickly implement robust inspection, color matching, symbol decoding, OCR and more in a single compact vision solution. 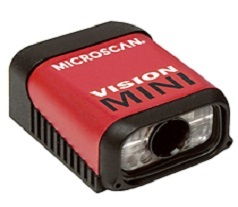 The Vision MINI is the world’s smallest fully integrated vision system. Its compact size allows flexible positioning in tight spaces. The lightweight and durable magnesium alloy case weighs less than 2 oz. The Vision MINI delivers both high performance and reliability, along with the assurance of long term availability and support. This is essential for OEMs, who require uninterrupted availability throughout the lifecycle of their products, and enables them to focus on new development instead of obsolescence issues.